This collection presents creative strategies and programs designed to address needs of families in the context of rural communities. Even before the most recent worldwide economic crisis, many rural families in the United States struggled to meet basic needs. As needs in rural communities have expanded, services have shrunk. This book identifies rural families’ needs, including social supports during pregnancy, identification of adolescent risk behaviours, child safety, and basic services such as food and health care, using techniques such as Geographic Information Systems and needs and asset assessments. Strategies to address those needs include program development, the use of technology, and community partnerships. The book reminds readers of the sense of independence and self-reliance found in many rural communities and the theme of diversity within rural communities runs throughout the book. The chapters are organized by identification of the needs of rural families, addressing disparities in rural areas, practice in rural communities, and human service organizations and professionals. 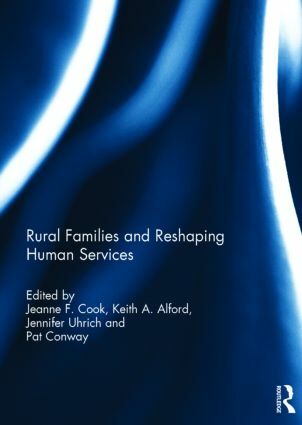 Through research, practice, and creative works, the book contributes to a greater understanding of ways that service providers can advance their work with rural families and broaden their perspectives about realities experienced by families living in rural communities. This book was originally published as a special issue of the Journal of Family Social Work. Jeanne Cook, Ph.D., LISW-CP, has 25 years experience as a social worker in child welfare. She has been a social work educator since 1995 and joined the faculty at Johnson C. Smith University, USA, in 2011. In 2012, she was appointed as the director of the JCSU MSW program. Keith A. Alford, Ph.D., ACSW, Associate Professor, School of Social Work, Syracuse University, USA, is a former Treatment Foster Care Supervisor and Child Protective Services Worker. He has worked in human service agencies serving mid-western and southern rural communities. His research areas include family mental health and culturally specific programming. Jennifer Uhrich, MPA student, University of Southern California Sol Price School of Public Policy, USA, is an assistant editor of the Journal of Family Social Work. Currently enrolled in the University of Southern California Sol Price School of Public Policy MPA program, she is an experienced qualitative researcher. Pat Conway, Ph.D., LCSW, Senior Research Scientist, Essentia Institute of Rural Health, USA, is the editor of the Journal of Family Social Work. She conducts research regarding health, behavioural health and public health issues in rural and tribal communities.